Below this text is the Version 2 photograph. 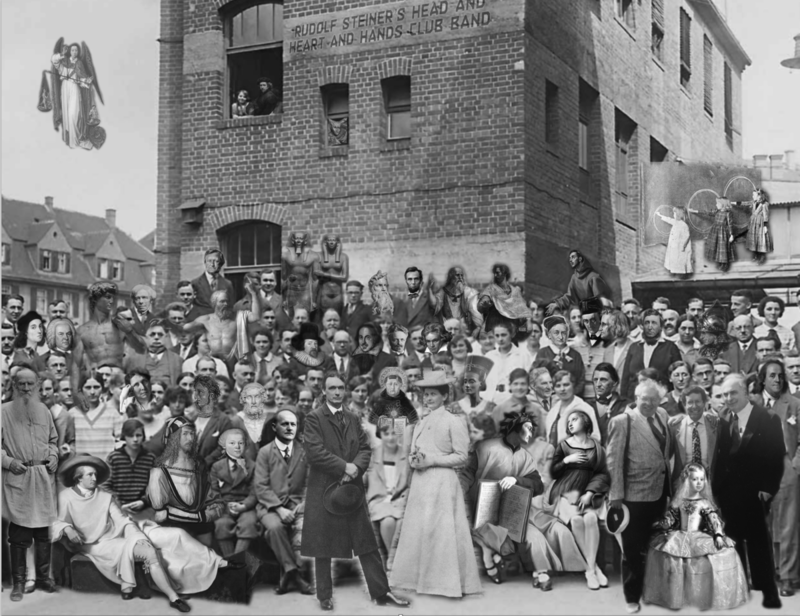 Many of the workers portrayed in the original photograph were the ones who asked Emil Molt and Rudolf Steiner to create the school, but they were not alone. 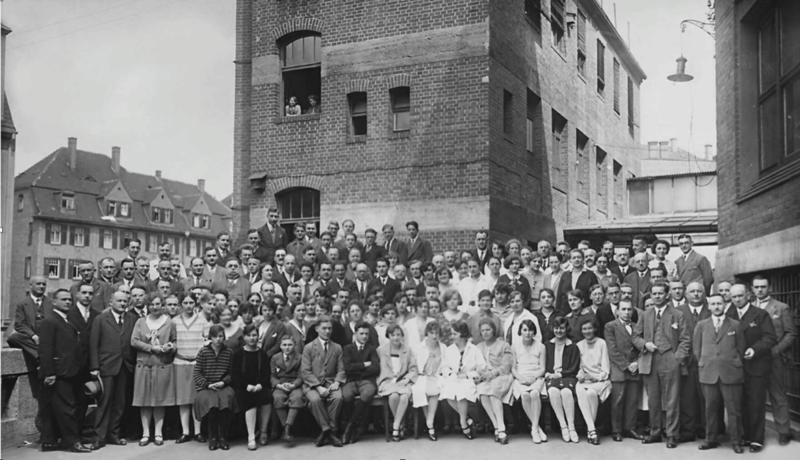 The workers' photo was taken just weeks before the first Waldorf school would be born. We tried to imagine the host of individualities — most human, some divine, many dead, some living, and some not yet incarnated — who gathered to eagerly help, support, and celebrate the school's founding. This photograph captures something of the vitality and joyous expectation that swirled that day on the factory grounds. For names and information about the Individualities present on that fateful day in 1919, hover your mouse (or tap with your finger) over the RED circled number. To simplify navigation through the crowded scene, the photo has been divided in three sections. Scroll down and you will have a chance to meet all of the nearly fifty visitors who may have appeared just weeks before the original Waldorf school was to welcome its first students. Even the large scale of the photograph did not permit the inclusion of hundreds of personages and Beings who deserve to appear. Among those from the Past are: Adam and Eve, Abraham, Joseph, St. Luke, St. Paul, St Odelia, St Christopher, Pythagoras, Thales, Julius Caesar, William Blake, Buddha, Cicero, Albertus Magnus, Brunetto Latini, Zarathustra, Gilgamesh and Ibani, Novalis, Schiller, Christian Morgenstern, Karl Koenig, A.C. Harwood, Margaret Froehlich, Henry Barnes, Roy Wilkinson, C.S. Lewis, J.R.R. Tolkien, and many, many others. Our thanks to Paul McCartney, Jann Haworth, and Peter Blake, creators of the iconic album cover for the Beatles' inimitable Sgt Pepper's Lonely Hearts Club Band . Among those from the Present who should take their place in this photographic Pantheon are: Patrick Wakeford-Evans, Ted Mahle, Roberto Trostli, Torin Finser, Karine Munk Finser, John Alexandra, Betty Staley, Douglas Gerwin, Arthur Auer, Norman Davidson, Clifford Monks, Arline Monks, Ida Oberman, Brian Gray, Michael Heffernan, Jaimen McMillan, Bonnie River, Thom Schaefer, Donna Long, Prairie Adams, Anna Rainville, David Mitchell, Chip Romer, Allegra Allesandri, Susan Olson, Kim John Payne, Jamie York, and many, many others. EUGENE SCHWARTZ [Continued] . . . . Werner and Rene gave Eugene the task of carrying Waldorf teacher training into the 21st century and urged him to help establish a center in Colorado, far from the bi-costal competition of their training centers. Their prognosis was correct; both Sunbridge and Steiner College declined after their founders died, and today few teachers are trained at either setting. Eugene could see that schools would be less able to cope with a broad range of new pedagogical and social issues and that an army of what he would term "Waldorfpreneurs," each a specialist in a narrow field, would begin to play an unprecedented role in the further development of Waldorf education. At the same time, it became clear to Eugene that, regardless of who was at the helm, the golden age of the "brick and mortar" training center was coming to an end. He came to understand that taking Waldorf training into the future would mean making a connection to the computer, to the Internet, and in time to mobile devices and whatever else modern technology dreamed up. As the 21st century dawned Eugene focused on developing the skill set to create what are now the Online Conferences. Although his efforts were often dismissed or disparaged, virtually every Waldorf and anthroposophical endeavor today uses the Internet for publicity and/or pedagogy. In fact, you wouldn't be reading this right now if you didn't recognize the importance of what appears only in digitized form. One hundred years after the first Waldorf school's founding, Waldorf education is, however reluctantly, beginning to meet the future.